WatchAware: Watch Apps - great catalog of watch app demos. FastCompany: How the Apple Watch will work... - a couple of thoughts on app design, and screenshots of Todoist. eleks labs' unofficial Tesla app - more design thoughts and prototype video (unofficial development, not affiliated with Tesla).. Daring Fireball: On the Pricing of the Apple Watch - so yeah, "starting at $349" sounds like it's going to be the understatement of the year. WatchKit FAQ - awesome collection of questions and answers (and cute watch drawings too). MartianCraft: Designing for the Apple Watch with Briefs - even if you don't use the tool (which looks great) this is a lovely post on Watch app design. Five Minute Watch Kit - good collection of blog posts. 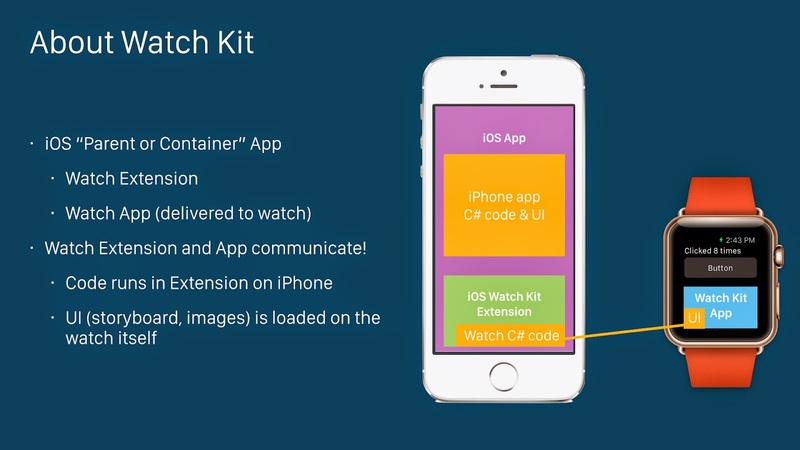 If that's got you interested in building apps for the Apple Watch, it's time to check out Xamarin's Watch Kit Preview and how to get started (inc video) and my first watch app. I've also got a couple of samples, including Magic 8 Ball, Calculator, Insta, and Todo for you to try. ^ watch frame screenshots generated with Bezel thanks to the fine folks at infinitapps.